Over a decade of partnership. Thrivent Financial is a financial services organization that helps Christians be wise with money and live generously. As a membership organization, it offers its more than 2.3 million member-owners a broad range of products, services and guidance from financial representatives nationwide. For more than a century it has helped members make wise money choices that reflect their values while providing them opportunities to demonstrate their generosity where they live, work and worship. This program sponsors the construction of Habitat for Humanity homes across the country, and engages thousands of volunteers to help build these homes. Thrivent Builds Homes has built more than 2,280 homes and impacted more than 4,000 families. As part of Thrivent Builds, the Thrivent Builds Repairs initiative helps to provide funding and volunteer support for Habitat for Humanity’s home repair projects. Thrivent Builds Repairs, in partnership with Habitat for Humanity International, has repaired more than 2,100 homes since 2013, providing safe and stable housing to families across the U.S. Become a Thrivent Financial member, and learn to be wise with your money and live generously. 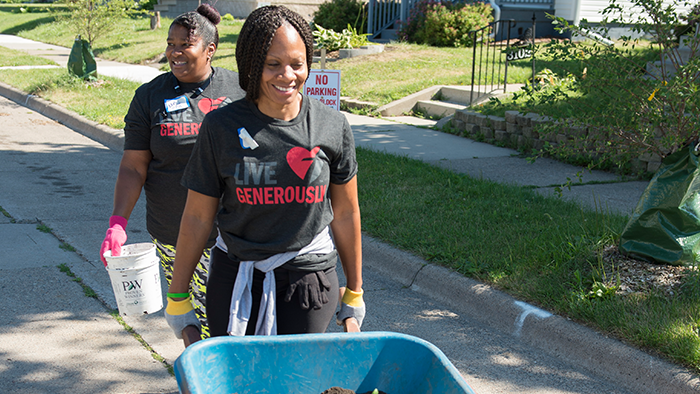 Thrivent members can direct Choice Dollars to participating organizations, including Twin Cities Habitat for Humanity! All Thrivent members are eligible to lead a Thrivent Action Team. Thrivent will provide $250 in seed money to raise awareness and funds for issues important to you. Host a bake sale or fund a single build day using Action Team money to make a greater impact with Twin Cities Habitat.